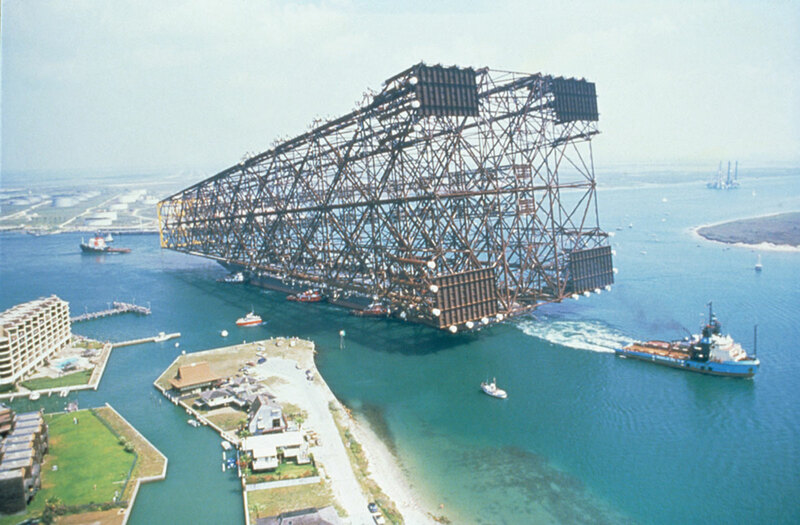 In this unbelievable photo we see the colossal base of an oil platform being towed out to sea. Made from steel, the frame or base is known as a ‘jacket’ and the oil platform is affixed to the top. According to 2b1st Consulting, 95% of the offshore platforms in the world are jacket designed. In these situations water depth does not exceed 500 m (1,640 ft) and the platforms are anchored directly to the seabed. This particular jacket was installed in 1988 by Shell in the Gulf of Mexico and was regarded as one of the most extraordinary engineering feats of the 20th century. The platform was nicknamed ‘Bullwinkle’ and was the world’s tallest oil rig at the time of construction. It is 150 ft taller than the Willis (Sears) Tower in Chicago and was built entirely in Texas before being towed, in one piece, 332 nautical miles to its final location. Bullwinkle used 10 times the amount of steel as the Eiffel Tower and weighed over 50,000 tonnes. Construction of the jacket alone took 2.5 years and to tow it out to sea, an 853 ft long barge—also world’s largest at the time—was constructed. The entire project took over 5 years and cost over $500 million in the 1980s. Check out the fascinating video embedded below which provides a great overview of this remarkable engineering project.